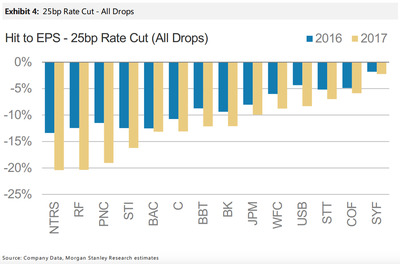 The big banks are already reflecting a rate cut. Banking shares tumbled in the past few days along with the rest of global markets following Britain’s vote to leave the European Union last Thursday. Among investors’ concerns are the impact that the tedious process of leaving the EU would have on banks’ trading businesses. Also, continued market volatility could mean the Federal Reserve is more reluctant to raise rates, and banks theoretically fare better when interest rates are higher. 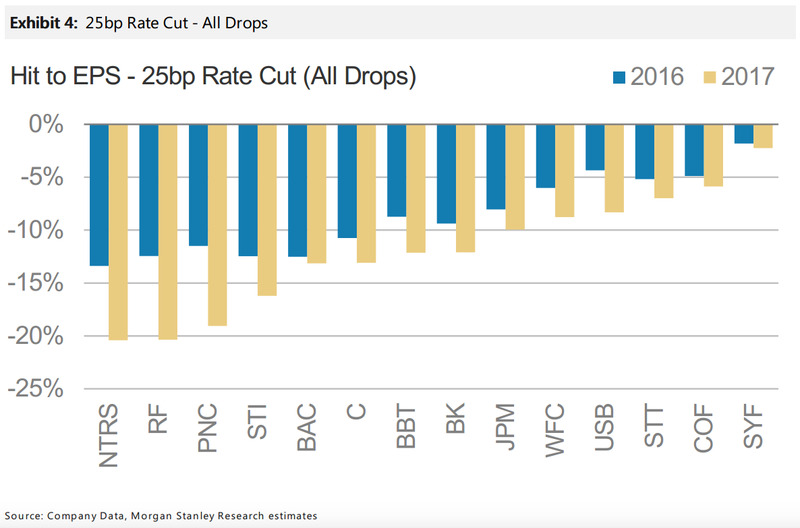 In a note Tuesday, Morgan Stanley equity analyst Betsy Graseck said the drop in bank stocks has already baked in a cut in rates. As investors flocked to Treasurys during the market volatility, yields fell, as they do when bond prices rise. The yield on the overnight portion of the yield curve fell five basis points from the pre-Brexit close on Thursday, while the benchmark 10-year yield declined 28 basis points. This not to say Graseck is anticipating a rate cut from the Fed, which raised the federal funds rate by 25 basis points to a range of 0.25% to 0.50% in December 2015. Following the Brexit vote, fed fund futures — one gauge of market expectations — reflected a much lower than 50% chance of a rate hike through February 2017. They showed a 0% chance of a rate hike at the Fed’s September and November meetings, and a slim but higher 15.5% chance of a rate cut, according to Bloomberg.